Hair Hut Studio, You can find us at, 295 Saw Mill River Rd, Yonkers NY, 10701. More than just a hair color and style, the team at Hair Hut Studio have formulated a unique product range of hair care that works like skin care. Whether you have just visited our salon or use the range at home, Hair Hut Studio products allow you to achieve the style you deserve. Hair Hut Studio is a full service hair salon with over 30 plus years experience. We have been in business and at this location for over 35 years. We specialize and are experts in men, women, and children hair cutting, hair coloring of all types, hi-lights, perms, braiding, and Up do’s. We offer Keratin Treatment as well as scalp and hair treatment upon request. Other services may be offered upon request, so please call us to inquire. 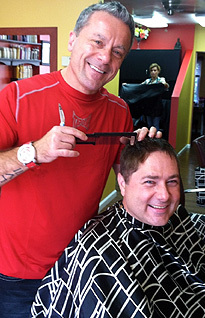 Our staff and stylists are very knowledgable, friendly, courteous, and strive in every way to satisfy our customers. Customer satisfaction and making our customers look more beautiful is our #1 priority! In business for over 35 years at same location. What makes Hair Hut Studio your preferred hair salon in Yonkers NY? A commitment to bringing the cutting edge techniques, trends and styles up from Yonkers City and making them accessible to all needs and budgets in a central salon location in Yonkers, NY. And what does that commitment entail? Meet our Hairdressers, Hair Designer & Colorists – Steve, Carla, Cookie, Michelle and Paula. You will feel comfortable at Hair Hut Studio knowing that your positive experience with our hair care professionals is our number one priority! Contact Us today at 914-969-1400.